Peirce, Lincoln. Very Good. Big Nate: In a Class by Himself (Big Nate (Harper Collins)) by Peirce, Lincoln. Sewn binding. Cloth over boards. 224 p. Contains: Illustrations. Big Nate (Harper Collins). Intended for a juvenile audience. Peirce, Lincoln. Very Good. 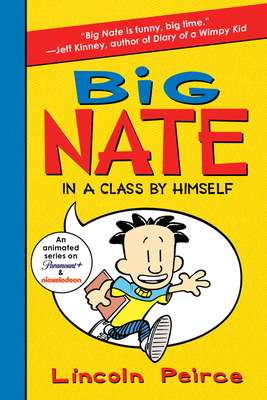 Big Nate: In a Class by Himself (Big Nate (Harper Collins)) by Peirce, Lincoln, 2010-03-23. Library binding. Paper over boards. 214 p. Contains: Line drawings, black & white. Big Nate (Harper Collins). Intended for a juvenile audience.